We often talk about what a great value cruise vacations are, and it’s true. But cruise lines have become experts at up-selling auxiliary items to guests while they’re on-board to make extra profits. The last thing you want is to come home thinking you got scammed, because it takes away from feeling relaxed and recharged after your vacation. So here are 7 ways to avoid feeling nickel-and-dimed. The best way to guard yourself against feeling nickel-and-dimed is to educate yourself on what’s included in your cruise and what’s not. Typically, your cruise fare includes your accommodations, food, entertainment, and of course the journey to the ports of call. Most cruisers also understand that costs like gratuities, excursions, and alcohol/sodas are not included. 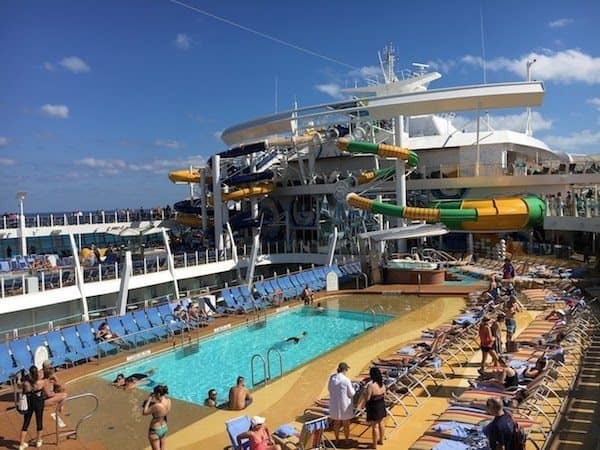 However, cruise lines are getting sneakier these days about finding ways to increase profits by creating specialty restaurants, charging for access to adults-only decks, or charging for onboard activities (like Royal Caribbean’s North Star pod and Ripcord skydive simulator, both of which started out as free when they debuted). The more you study your cruise line and ship before your trip, the better idea you’ll have going in of what to expect and whether you need to budget extra. If you’re sailing on a ship that you anticipate to have several up-charges for onboard activities, set your expectations before you sail. If you go in anticipating these extra fees, you won’t leave your vacation feeling like you got nickel-and-dimed, because typically this feeling of being “scammed” is based on the element of surprise – the fact that you weren’t expecting these extra fees. Your travel agent can help you learn your cruise line and ship before your vacation so that you have a good understanding of what you’ll find onboard. For example, if you’re booking a cruise on one of Norwegian’s Breakaway-class ships, your agent could explain to you that these ships offer an adults-only deck called The Vibe Beach Club, and they could also tell you that it’ll cost you to enjoy this deck – anywhere from $20 for a daily pass to $79 for a weekly pass. One way to avoid all those extra cruise fees is to just book an all-inclusive cruise. If you’ve got the extra cash, luxury cruise lines like Regent Seven Seas, Crystal Cruises, and Silversea Cruises are often all-inclusive in their fares, with some even including airfare to the embarkation port. For those of us who don’t have the spare change for these luxury lines, Norwegian Cruise Line has a “Free at Sea” program where you can take advantage of select offers of free drinks, free wifi, free shore excursions, free specialty dining, and/or free fare for the third and fourth guests in a stateroom – all depending on the category of stateroom that you book. It may not be quite “all” inclusive, but it’s pretty darn close. For those of us who don’t have the spare change for these luxury lines, Norwegian Cruise Line has a “Free at Sea” program where you can take advantage of select offers of free drinks, free wifi, free shore excursions, free specialty dining, and/or free fare for the third and fourth guests in a stateroom – all depending on the category of stateroom that you book. It may not be quite “all” inclusive, but it’s pretty darn close. By knowing your ship and what to expect before your cruise, you can plan ahead for potential up-charges. If you know there are for-fee activities you want to do or specialty dining restaurants you’d like to eat at, you can set aside a budget for these in advance so that you won’t feel nickel-and-dimed once onboard. Just be sure to be realistic in your plans and your budget. Even if you make a plan, it can be tempting to want to throw it out the window as soon as you step on the ship. After all, you’re on vacation – you deserve it! But you will feel twice as guilty and stressed when the vacation is over and your bill is double what you anticipated if you stray from your intentions. It can be especially hard to stick to a plan if you’re traveling with friends or family who try to influence you otherwise, but there’s no use in making a plan if you don’t stick to it. As with any cruise, it’s best to keep a “rainy day” fund set aside. That way, if you do in fact find yourself coming home with a big balance on your credit card from all those extra unexpected expenses, your rainy day fund will soften the blow.